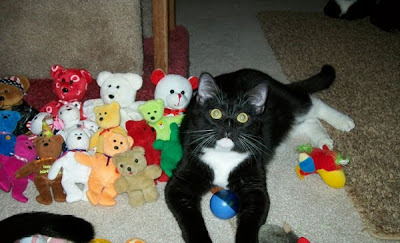 Welcome back for another edition of Caturday, where we get to know some of my readers fantastic felines! It's been all lady kitties the past few weeks, but get ready, because today is all about the manly ManCats! That's right, today we have three handsome fellows to introduce you to: Meet Champion, Mr. B, and Odin! 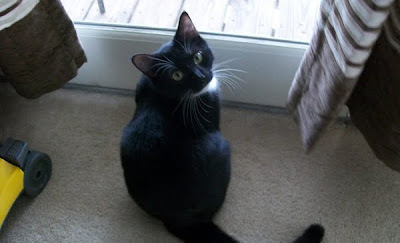 First up, we have Champion, a little tuxedo boy born in April 2010. His owner, Sandra calls him "her funny little feline," and tells me that his mother stopped feeding him at five weeks old, so she took him in and bottle fed him until he started eating on his own! It only took a few weeks for him to integrate with Sandra's three older kitties, Cheddar, Chazz, and Chase, who became his brothers. Champion himself decided to fill me in on the rest of his story.. Read on for more! Getting some lovin' from Mommy! My name is Champion and I am so loved and spoiled! I dip my paws into my water dish and make my Mommy laugh! Here I strike a funny pose that Mommy is so glad she caught on camera! My favorite toy is the laser light and milk top rings, and my favorite way of being a funny tuxedo cat is that I wash my paws in the water dish I share with my brothers! I also love to lay in the window, and watch everything outside! "One of these things is not like the other.."
Thanks, Champion! It looks like you truly are a hero to all! Kudos to Sandra for taking him in as such a small kitten, and for helping him become the healthy, lively lovemuffin he is today! Next up, we have another addition to my collection of pictures of kitties being helpful office assistants (You can see more examples here and here). Lia wrote in to say, "Here's my Mr. B in his very best attempt at "helping," or should I say, "hindering" my job! I was looking for jobs and apartments, and he slapped his paw on the keyboard in an attempt to say, "But I don't want to move again, Ma!" You, see I've had him for 8 years and we've moved 5 times in those 8 years (including this last one)!" Mr. B is just precious! With a face like that, how can you resist him, Lia? I really like his "paws on" approach to office work, and if I'm ever in the market for a new feline assistant, I'd say he's a shoo-in for the job! And finally, we have some very special Easter greetings, courtesy of one curious kitty-cat! Layla (who also has a fab blog, which you can check out here) writes, "My one-eyed naughty cat Odin got into the Easter spirit." Special thanks to Sandra, Lia, and Layla for sharing their wonderful cats with us this week! Happy Passover and Easter to all! Want to see your cat(s) on Catsparella? I'm always taking submissions for my weekly Caturday post! 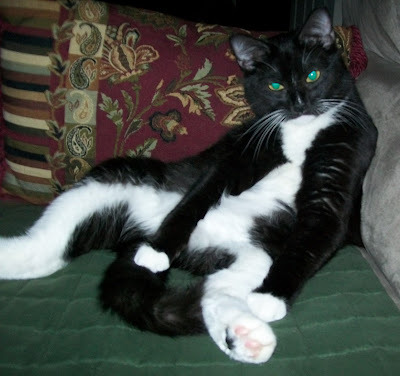 Email your best kitty pics to catsparella@gmail.com, and include your cat's name and anything else you'd like to share! I can't wait to hear from you! Champion is adorable! I'm already a fan of mischievous Odin. What fine collection of man-cats! I'm partial of course to my Odin who at 10 and half months is on the verge of being a true man-cat. I wonder, at what age does a cat change officially from kitten to mancat? Look at Champion..he was such a tiny baby and became such a handsome ManCat! fabulous mancats!!! Champion is a cutie (they all are!) and his Mama is soooo pretty!!! Thanks for sharing these! MOL.. I like the way Champion sit : ) Really Tuxedo Boy's thing ! Let's hear it for the mancats! From Julie...Goodgie, goodgie, goo..they are so adorable, Champion and littermates celebrating a birthday, too! Have a very Happy Easter and Passover! What a cutie! 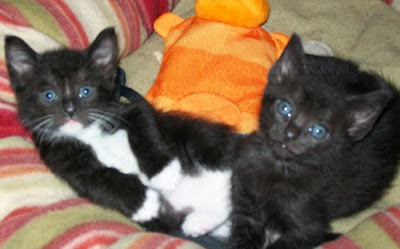 Of course, I'm partial to Tuxies and solid black kitties like my Jules and Vincent. Thanks for participating in Weekend Cat Blogging. Hope to see you again soon. Champion, what a handsome boy you are! Happy Easter to all those fine mancats (kittens!) and to you Catsparella! Such beautiful pictures! Purrs to you handsome Champion! Oh what a beautiful BOY!!! I have kitten envy, big time! Those all look like great kitties. We are a little partial to Odin since we have already made friends with him and his Mom. But we love tuxedo cats too. Great post. Have a great week. We're not sure what happened to our comment, so we'll try again. We really love how that handsome Champion sits like a human on a sofa. Thanks to his mom for adopting him at such an early age. Precious Odin ... we hope you found lots and lots of nommy Easter treats! We hope you all had a great Easter, and that your Passover is happy.